A quick update to let our readers know about the upcoming tournaments here at Roda Golf. These tournaments are always fantastic affairs, we advise interested parties to book early! InterClubs Roda Golf vs Golf Altorreal. March 7th at Roda and April 25th at Altorreal. This is an individual and Club competition. Both Tournaments includes green fee and Meal (Paella), to share friendship among institutions. The Tournament is reserved for 50 players from each Club. There are individual prizes in each day, and a Trophy for the Club winner. Shot gun start at 9:00 in both courses. We are going to celebrate a Golf Tournament that includes a few beers at the end of the game. The Tournament is reserved for 48 players, and the first tee time is at 11:00 and then, every 10 minutes. Roda Golf has staged it's very own Ryder cup over the weekend of June 7th and 8th! Don't get carried away... whilst it was a European team vs a British team, we did not see Severiano Ballesteros or Jose Maria Olazabal out there! There was however some fantastic golf played and even though the weather wasn't the best, it was a tremendous spectacle for all who turned out to enjoy the event. The Roda Golf course came in for yet more plaudits with everybody loving the golf course and the facilities. One of the golf professionals from a nearby course commented that whilst Roda is not the most difficult course in the region (it was never meant to be) it was certainly the nicest looking and the best kept, wow! praise indeed for a golf course less than two years old! You can view the brand new 360 degree virtual feature at www.rodagolf.com and click on the golf course, English is available at this site, just click on the flag. This is a fantastic feature and well done to Calidona for providing it, if you have not visited the site and seen this feature, you in for a treat. The clubhouse at Roda Golf and the restaurant was the real winner. The food was fantastic, and even the service was "spot on". There has been some small level of criticism levelled at the staff concerning the service, however some new, and might I say excellent, staff have now joined the team and everything at Roda is now as you would expect from a 5 star resort. Roda Golf are now offering night time practice facilities with the driving range now being floodlit, the range is open until 11.00pm. I bet the wives (or golfing widows) will be delighted to hear of this! The mood and general atmosphere over the weekend at Roda Golf was awesome, residents and visitors alike all mingled together with the golfers and everybody had a great time. With plenty more facilities still to come and lots more competitions due this year, the future promises to be very exciting at Roda Golf and Beach Resort. Celebrity news! 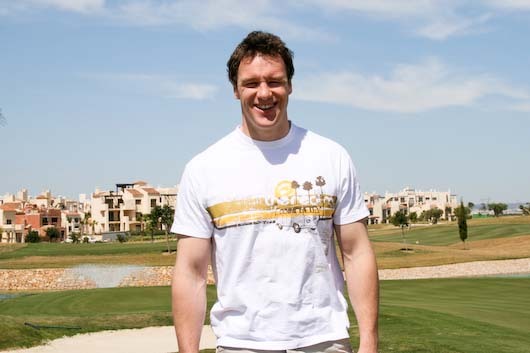 Look who we bumped in to at Roda Golf today, you Welsh owners and rugby fans out there will recognise Mark Jones, the Llanelli Scarlets and one of this season's Wales 6 nations Grand Slam winners! The number 14 for Wales was enjoying a much deserved vacation at the Roda Golf and Beach Resort with his wife Helen, fresh from celebrating the Grand Slam win over France just a couple of weeks ago. Well done Mark and congratulations from the Roda Golf Info team! This was Mark and Helen's first visit to Roda Golf for over 12 months and they thought it was fantastic, they were both very impressed with the progress at Roda Golf and Mark told us, he thought the new Roda Golf clubhouse and PGA academy facilities were just sensational, we even caught him hitting a few balls on the range, good to see you Mark and thanks for your time today, come back and visit soon.